This arugula, radicchio, and goat cheese salad will make your mouth sing. The salad’s barely bitter radicchio and bittersweet arugula, combined with the goat cheese, really wake up your taste buds. Peel and very thinly slice the shallots. Finely mince the garlic clove. Combine the shallots, garlic, oil, vinegar, Splenda, parsley, salt, and pepper in a medium bowl. 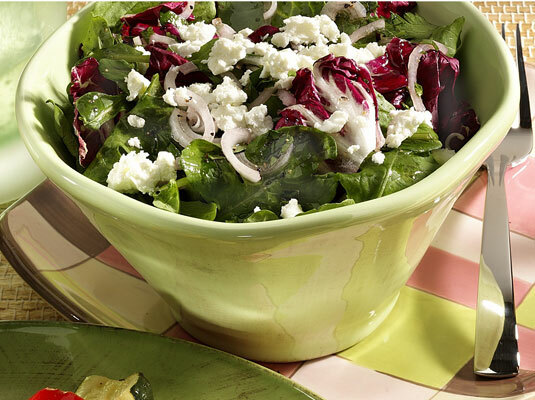 Combine the arugula and radicchio in a large salad bowl, tearing the greens into bite-sized pieces. Pour the oil and vinegar mixture over the prepared greens, tossing gently just to coat. Allow the dish to sit for 4 to 5 minutes. This wait allows the flavors to mingle. Crumble the goat cheese over the salad. Divide among six salad plates and serve immediately. Per serving: Calories 133 (From fat 100); Fat 11g (Saturated 4g); Cholesterol 9mg; Sodium 185mg; Carbohydrate 4g (Dietary fiber 1g); Protein 5g.